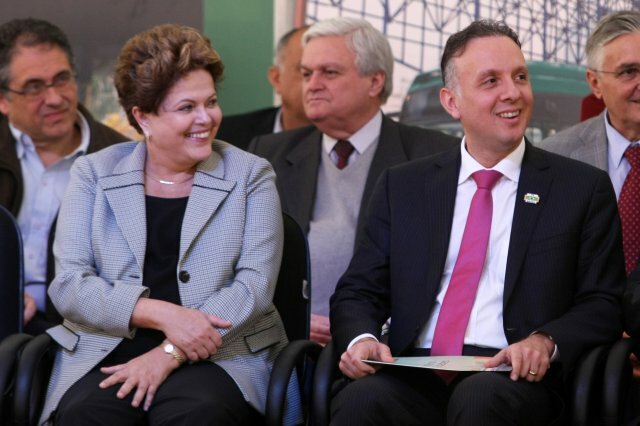 President Dilma Rousseff and Minister of Cities Aguinaldo Ribeiro made the announcement of funding in São Bernardo do Campo, yesterday, August 19th. Photo by Rodrigo Nunes / MinCidades. This year, São Paulo has launched 100 km (62 miles) of bus lanes across the city, doubling the speed of public transport. Recently, a Sao Paulo newspaper, O Estado de S. Paulo, ran an experiment, in which two teams traveled a 23 km (14.2 miles) path through the city by both bus and car. The team that took public transport made the trip in 29 minutes, from 6:47 a.m. to 7:16 a.m. The car’s trip took one hour and 11 minutes. The time-saving advantage, however, still hasn’t persuaded many of the drivers stuck in traffic decide to switch to public transport. A survey of the Institute of Education and Research (Insper) concluded that simply improving public transportation is not enough to get drivers out of their cars. Researchers Rodrigo Moita and Carlos Eduardo Lopes developed an algorithm to simulate the pattern of choice of the population, considering factors such as income, passenger flow, and route to be traveled. They concluded that for drivers to migrate to public transport, the cost of driving a car must increase. According to research, a toll of 1 Brazillian Real ($0.42 USD) per vehicle would reduce congestion by 6%. Yesterday, on August 19th, President Dilma Rousseff and Minister of Cities Aguinaldo Ribeiro announced investments of R $ 2.1 billion ($880 million USD) from the Growth Acceleration Program (CAP 2) for the industrial region of Greater Sao Paulo, known as “The ABC Region.” $331 million USD (R$ 795 million Brazillian Reals) of this amount will be dedicated to improving the ABC region’s urban mobility. Most of this funding will go to improving bus transport, focusing on building additional rapid transit corridors. The new lanes will benefit many cities in the state of Sao Paulo: Santo André, São Bernardo do Campo and São Caetano do Sul, Diadema, Maua, Ribeirão Pires and Rio Grande da Serra. Though many drivers may need coaxing to switch to public transport, the improvements brought by exclusive bus lanes are already visible. In one stretch, the bus-only lanes have improved the average bus speed from 15 km/h (9 mph) to 24 km/h (15 mph), a 58% increase. Unfortunately for car users, the lanes have also slowed car traffic, at least temporarily. The average speed of cars in this particular corridor dropped from 22 km/h (14 mph) to 18.5 km/h (11.5 mph) after the implementation of the bus lanes. The goal is to reach 220 kilometers (136.7 miles) of exclusive lanes for public transport by the end of the year. For everyone in the state of Sao Paulo to benefit from these investments, public transportation needs to be more than just an option. It should be the best option. This post is based on two posts originally published in Portuguese on TheCityFixBrasil. Faixas exclusivas deixam os ônibus mais rápidos em São Paulo by Priscila Kichler Pacheco and Mais R$ 795 milhões para a mobilidade urbana em SP by Luísa Zottis.